Decorating a girl’s room and want it to be thoroughly feminine down to the very last detail? 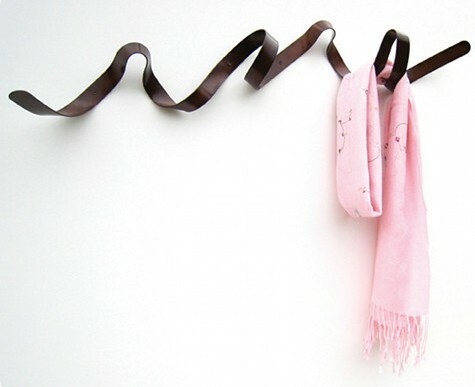 The Ribbon Coat Rack by Headsprung is inspired by a ribbon blowing in the breeze and is perfect for a little girl’s room that is all about style without the frou frou. The Ribbon Coat Rack’s sculptural form is designed to be a piece of wall art when empty but when needed, its five ‘hooks’ can be used to hold coats, bags, umbrellas and so on. Each Ribbon Coat Rack is handmade from powder-coated steel and is available in a range of colours from glossy red and yellow to matt black or white. As they are handmade, no two coat racks are exactly alike. The Ribbon Coat Rack is £55. Shipping to Australia is by arrangement with Headsprung. If you’re on the hunt for hooks but want something more suited for a boy’s room or a playroom, check out some of our previous posts.